Something is brewing in the South China Sea. The Chinese call it tourism. The Vietnamese, the Taiwanese, and the Japanese see a military buildup. While the rest of the world thinks it boils down to oil and gas reserves. No matter the reason, there’s a new city being built on Woody Island. And the remote Paracel Islands will never be the same. The Paracel Islands, an archipelago of more than 130 small islands, are spread out over nearly 6,000 square miles south of China and east of Vietnam. The low-lying islands are surrounded by sandy cays, shallow reefs, and bright turquoise water. Despite being claimed by at least five countries, sea turtles, seabirds, and a few fishermen were the only things that lived on the islands for hundreds of years. Woody Island, the largest of the Paracel Islands, sits in the center of the Amphitrite Group of islands. The 530-acre island is filled with palm trees and a landing strip. 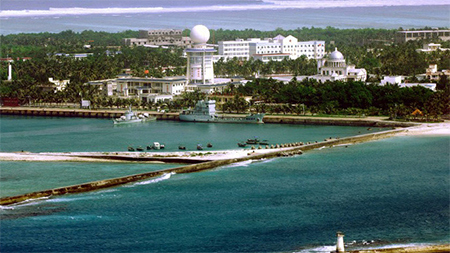 The few tourists who arrived would visit two museums—the Xisha Maritime and Naval Museums—two Chinese monuments, and Japanese towers from World War II before heading toward the water. But the Chinese are making changes to Woody Island. Massive changes. Sansha, that new city, is quickly expanding. Cruise ships from China have started to dock in the artificial harbor. Resorts are already in the works. While the palm trees, the seabirds, and the sea turtles are quickly disappearing. If you’ve ever dreamed of visiting the undisturbed Paracel Islands, do it now. There must be plans for the rest of the islands, as well.